In his second book of narrative, lyric poetry, Richard Blanco explores the familiar, unsettling journey for home and connections, those anxious musings about other lives: "Should I live here? Could I live here?" Whether the exotic ("I'm struck with Maltese fever ...I dream of buying a little Maltese farm...) or merely different ("Today, home is a cottage with morning in the yawn of an open window..."), he examines the restlessness that threatens from merely staying put, the fear of too many places and too little time. The words are redolent with his Cuban heritage: Marina making mole sauce; Tía Ida bitter over the revolution, missing the sisters who fled to Miami; his father, especially, "his hair once as black as the black of his oxfords..." Yet this is a volume for all who have longed for enveloping arms and words, and for that sanctuary called home. "So much of my life spent like this-suspended, moving toward unknown places and names or returning to those I know, corresponding with the paradox of crossing, being nowhere yet here." Blanco embraces juxtaposition. There is the Cuban Blanco, the American Richard, the engineer by day, the poet by heart, the rhythms of Spanish, the percussion of English, the first-world professional, the immigrant, the gay man, the straight world. There is the ennui behind the question: why cannot I not just live where I live? Too, there is the precious, fleeting relief when he can write ..".I am, for a moment, not afraid of being no more than what I hear and see, no more than this: ..." It is what we all hope for, too. In his second book of narrative, lyric poetry, Richard Blanco explores the familiar, unsettling journey for home and connections, those anxious musings about other lives: aShould I live here? Could I live here?a Whether the exotic (aIam struck with Maltese fever a]I dream of buying a little Maltese farma]) or merely different (aToday, home is a cottage with morning in the yawn of an open windowa]a), he examines the restlessness that threatens from merely staying put, the fear of too many places and too little time. The words are redolent with his Cuban heritage: Marina making mole sauce; TA-a Ida bitter over the revolution, missing the sisters who fled to Miami; his father, especially, ahis hair once as black as the black of his oxfordsa]a Yet this is a volume for all who have longed for enveloping arms and words, and for that sanctuary called home. aSo much of my life spent like this-suspended, moving toward unknown places and names or returning to those I know, corresponding with the paradox of crossing, being nowhere yet here.a Blanco embraces juxtaposition. There is the Cuban Blanco, the American Richard, the engineer by day, the poet by heart, the rhythms of Spanish, the percussion of English, the first-world professional, the immigrant, the gay man, the straight world. There is the ennui behind the question: why cannot I not just live where I live? Too, there is the precious, fleeting relief when he can write "a]I am, for a moment, not afraid of being no more than what I hear and see, no more than this: ..." It is what we all hope for, too. "For those of us who became devotees of Richard Blanco's first, prize-winning book... this second volume is reason for celebration. 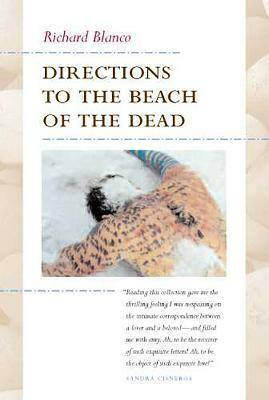 Mr. Blanco's Directions to the Beach of the Dead is absolutely breathtaking and gorgeous in its quest for place, family, self-discovery. This book is fresh... invigorating. [His] voice is unmistakably brilliant and original. For all poetry lovers, this will be a difficult book to top."